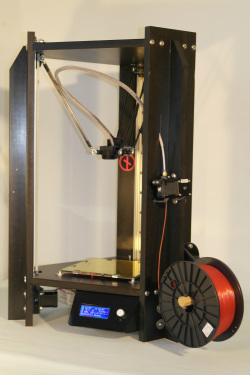 DeltaTrix 3D Printer is a capable and novel 3D printer, based on delta geometry. It is designed to be simple in construction, yet effective in functionality. It is fully open sources and you can use Repetier host software on your pc, which is also open source and it has provisions for the delta layout. We have recently published the design for the DeltaTrix 3D printer on http://www.instructables.com/id/DeltaTrix-3D-Printer/. On this website you can have a look for the instructions on how to build our DeltaTrix 3D Printer from scratch. Check out www.DeltaTrix.com website for more information.